For the second year in a row, we are proud to support Amity Regional High School’s Spring drama production. This year, the Theater Department is producing Into the Woods by Stephen Sondheim and James Lapine. Little Red Riding Hood and the Wolf both had their teeth done here before their big night in Into the Woods! Dentistry by Dr. Nicholas Calcaterra. 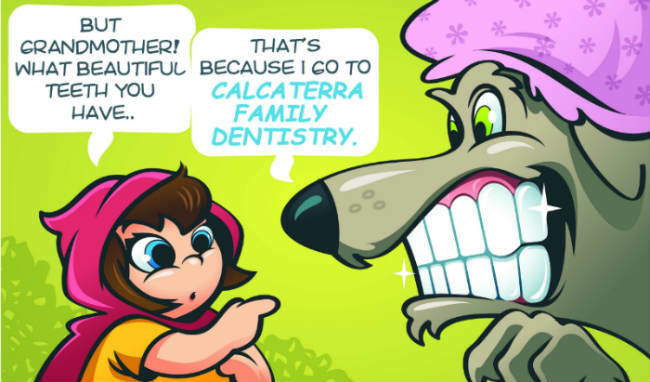 As you can see, the Wolf had his teeth worked on by Dr. Calcaterra. Dr. Nick did several porcelain veneers and then pulled the Wolf’s wisdom teeth. We think the results speak for themselves! All joking aside, we are proud to report that several of our patients are members of the Cast, Crew, and Orchestra. In fact, for every production for the past several years, we’ve had multiple patients involved. Congratulations to all those involved in this exciting show. And as we said last year, break a leg not a tooth!